Global Auto Fare Meter is similar to traditional mechanical meter. Its operation is controlled though the rotation of the flag. This is very simple to be operated. Nothing is required to be learnt. Apart from Fare it also displays the Distance Traveled and Waiting Time seperateley . It can also be run without battery on the coil. - In India, approved by the Department of Legal Metrology, Ministry of Consumer Affairs, New Delhi. 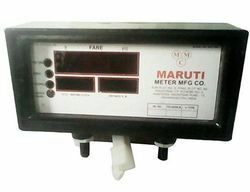 Sansui Digital Auto Rickshaw Meter i.e. Electronic Fare Meter is designed and manufactured with Japanese Technology under strict quality control standards, runs continuously by not reacting adversely to any external effects of vibrations, potholes on the road, electrical disturbances & high tension tower disturbances. Pricol's Electronic Auto Fare Meter Model 10R-1 is a solid-state micro controller based unit, which computes and indicates traveled fare and the distance in Auto-Rickshaws. 1.Micro-controller based design to assure efficient and reliable performance. 2.Bright displays to enable easy readability in sunny and bright environment. Our association is broadly known for maintaining the quality in offering Auto Rickshaw Meter. SILICON is in the phase of developing an "AUTO FARE METER" with highly advanced technologies like GPS, GPRS, CARD payment, Thermal printer receipts etc.. It has counters indiacating total Km. travelled and total Km. paid for. It is extremely beneficial for settling accounts between Taxi Owner & Driver. 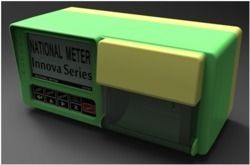 Owing to its simple design and high accuracy, this meter is widely appreciated by our precious clients. Moreover, to ensure the optimum quality, the offered meter is stringently tested by our quality experts on different parameters.